This is a LIMITED COLLECTORS EDITION CD release (meant for computer viewing ONLY) THIS IS NOT A BOOK. We have produced a very limited release of this Out Of Print Publication in CD format MEANT FOR COMPUTER USE ONLY. 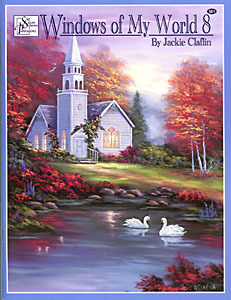 You can read and view the instructions and patterns, plus there are beautiful photographs to paint from. 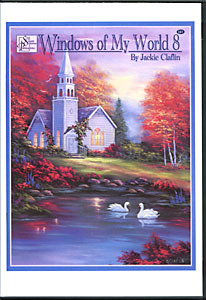 Jackie Claflins book Windows of My World Vol. 8 is sure to please all of the oil painters looking for new and exciting projects. 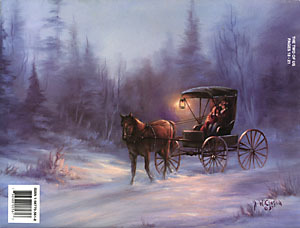 It is filled to capacity with a wide variety of scenes to capture on canvas. The beautiful jewel tones of Autumn and the beauty and peacefulness of a country church located along a stream are featured in The Light of Autumn. Youll feel the sea breezes and smell the salt air as you paint the elegant lighthouse in the evening light in Days End. 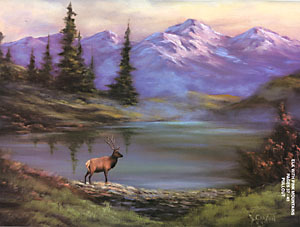 Mountains, deer, elk, secluded cabins, tipi or tent in the moonlight are present in natures splendor, giving the artist a wide variety of projects to choose from. 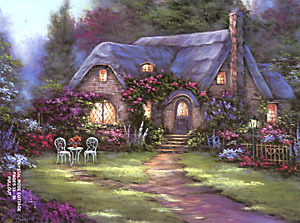 When you paint A Cottage Christmas, The Two of Us or Over The River you will feel how a blanket of snow silences the landscape and the chill of Winters frosting on the ground bring these paintings to life. Each of these paintings will make the perfect gift. 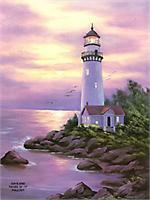 The romance and beauty of a dazzling sunset on a tranquil ocean guarded by a lighthouse and viewed from a terrace can be found in the Enchanted Evening painting. Jackie shares her friendly instructions that are clear, simple and easy to follow for beginners as well as the experienced painter. Her step by step instructions and patterns will make using oils fun and most rewarding. Color photographs and patterns are included. Any of these projects will bring nature and its beauty to your home and given as a special gift will be treasured. A must have book with hours of painting pleasure.